Klarstein Dolce Bacio is a brand new release XL family size, stainless steel ice cream maker machine in silver housing with an economical 180-watt power (220-240V ~ and 50 Hz) efficient compressor. It is an easy to use ice cream machine that can make as much as 67 fl oz ice cream, sorbet, gelato or frozen yogurt in a single batch. The smart LCD display panel has the On/Off button, Timer – and +, Mixing, Cooling and Ice Cream options. It is quite straightforward to use and you’ll be able to make a variety of frozen desserts very quickly in roughly an hour for hot days. And there will be no need for pre-cooling or freezing the container several hours before making the ice-cream thanks to this efficient compressor. Dolce Bacio gets the ingredients solid in its great thermal taste-neutral anodized aluminum container that measures 5.9 x 4.8 inches after you put in a variety of ingredients of your choice. There is a lock in the lid for the safe operation and the anti-slip rubber feet so it stays put. The built-in motor protection device also stops the motor if it is overheated for the overall longevity of the motor. 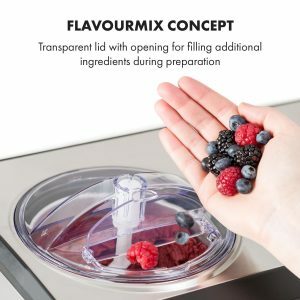 With the handy transparent FlavourMix opening on the left of the stainless steel lid, you can add the ingredients you want when the ice-cream maker is running. If you have a sweet tooth this great ice cream maker will help you satisfy your sweet needs in a healthy and tasty way, with the ingredients of your choice. This is important especially if you have certain allergies or lactose intolerance and can’t have the store-bought ice creams. Silver Dolce Bacio weighs 26.4 pounds, measures 11 x 16.5 x 9.8 inches and has a 4.75 feet (57 inches) long cable. The LCD-backlit intuitive control panel is very easy to read and operate. And you simply press the Start button and select time between 5 and 60 minutes after putting in the ingredients of your choice. It will make up to 2 liters of ice cream within an hour and will switch to another sixty minutes of cooling mode so that your frozen dessert will not melt. You’ll see the time countdown- the remaining time on the display panel. In the box, you’ll get the Dolce Bacio Ice Cream Maker, an ice cream scoop for serving and decorating, a BPA-free plastic stirring bar, and a user manual in English, French, Spanish, German and Italian. The cooling temperature is specified as -31° to – 0,4 degrees Fahrenheit (-18 and -35 degrees Celsius). It comes with the removable parts that make the unit easy to clean. It is usually shipped within a few days via Amazon.com. Please make sure you clean the parts like the fixed and removable container, blades, transparent lid, refill lid, spoon and measuring cup before use. 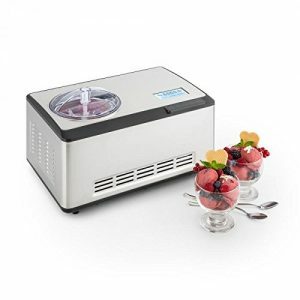 It is a great quality ice cream maker overall that offers decent value.